Looking for an ISP in Spain? Don’t choose Orange! Well I have to say, this is by far the worst “service” I’ve ever had from an ISP. I’ve tried to be patient, I’ve given more than fair time each time they’ve had issues. It takes FOREVER for them to react, and even when they do it seems to be a case of the left hand not knowing what the right hand is doing. The call centers are useless. They run you through a useless list of items (which I told them I had already tried several times before we called) then they claim your PC must be infected with trojans. (fair enough, ran the scans just in case, came up clean, as did antivirus and several other security sweeps) I even went as far as switching off all the computers in the house, and firing up the new Ubuntu Linux. 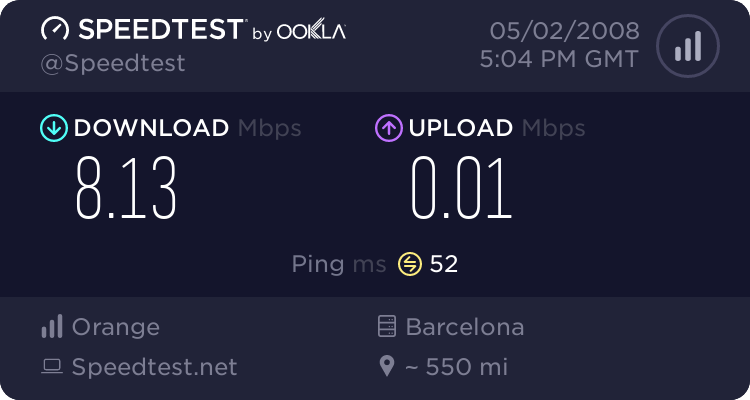 Keep in mind we supposedly have the “up to 20MB” which is 20Mb/1Mb (our router is actually connected at 16518 / 852 kbps)… we all know in the real world 20mb is not gonna happen, I’d be happy if we got half of what we supposedly should have… but as it is, our upstream connection would be faster on dialup! Some pages will not even load at the moment (even with 8mb speedtests) posting in forums can be painful, if possible, 9/10 times you end up with a blank page because the connection has reset rather than success. trying to upload some files to an FTP has been nearly impossible regardless of how big or small the files are, the connection is dropped repeatedly. I think they weren’t too far off when they when with a citrus fruit for a name, but perhaps they were confused… because apparently it’s more like one that begins with an L.